India is the only country in the world which has not matched its economic clout with sporting success. We are making giant strides economically, scientifically and militarily but we remain pygmies in the sports arena. Sometime in the early 1990s my brother joined the Voronezh State Technological Academy in the historic city of Voronezh in southern Russia. After performing brilliantly in his first year of engineering, he expected to sail through to the second year. But there was one last hurdle. He had to pass three of the following five fitness tests – long jump, high jump, chin ups, a 50 metre lap of the pool and a 100 metre run. I don’t remember what height, length or times were specified, but I know that he failed all three tests. The same day the dean called him into his office and said he couldn’t possibly let him proceed to Year II. The physical exams were compulsory and there would be no exception, even for a foreign student. Now, my brother may have been totally unfit physically but he’s a quick thinker. The same evening he went out and bought some Moldovan wine and Russian chocolates and paid a courtesy call at his professor’s house. Having got a lifeline, my brother took up his fitness regimen seriously. The very next day he joined the college gym and within two months had the physique of a wrestler. When his best mate, Volodya, returned from his holidays he at first couldn’t recognise his friend as they passed each other in a hallway. But when he did realize who this well-built guy was, all that the wide-eyed Volodya could say was, “Shto eta? That’s how Russia changed a 45 kilo weakling to a broad shouldered power lifter. It was immersion in Russia’s culture of all-round fitness that has made him what he’s today – a man obsessed with fitness. If Russia is an incubator of sporting excellence, India tries hard not to be. Growing up in India, we kids from middle class families were never encouraged to go near sports. I went to a pretty good school where the accent was on studies, studies, studies. Each day we had eight periods of 45 minutes duration for a total of 48 periods a week. Just one period was allocated for sports? Yes, that’s right less than an hour a week. And how did we spend those 45 minutes. Well, we would rush out of class, track down the sports teacher, get the keys to the sports room, the 20-odd boys would grab hockey sticks, form two teams of 10 each, and rush into the field. We had exactly 30 minutes left to play the game. There were only 30 hockey sticks so if another class got there first, we would play baseball, soccer, basketball, volleyball or kho-kho, a popular Indian game. We never liked cricket and at any rate it couldn’t be played in that short a period. The girls, because they wore skirts, couldn’t engage in strenuous physical activity and played slow basketball. Basically, we had all the facilities and they were excellent but it seemed that the schools basically had these facilities just to make the school look complete. Sporting excellence was not the aim. That was at school. Near our home we had a lovely sports stadium with grass mown like carpet. However, we were never allowed to play there because it was reserved for club-level sports (held only occasionally) and we neighbourhood kids were not considered good enough to come near it. Even if we snuck in there when the groundsmen were away, our parents would drag us home – to study. Is there a point in having sports academies? For, their only function seems to be offering jobs to the friends and relatives of politicians. Football associations are run by people who may not be able to bend it like Beckham but can bend at their political master’s will. The tennis academy officials are mired in litigation. The International Hockey Association has asked Indian hockey officials to sort out the mess they are in. Stadiums are hired out for musical evenings or political rallies. I remember my friend’s mother, a resident official at Delhi’s Yamuna Velodrome, had to periodically vacate her room because the ruling political party used to hire the venue for its annual meeting. She wasn’t alone. Dozens of cyclists and archers staying in the velodrome had their training schedule interrupted because they were also asked to pack their bags. Some of them were from India’s remote northeast states and had nobody in Delhi to turn to. Similarly, Delhi’s Talkatora Indoor Stadium was hired out for events such as the mango festival. Sure, the associations are entitled to make some extra cash but not at the expense of the players’ dignity. For Indian politicians, the sports ministry is like a bronze medal and they treat sports in a rather cavalier manner. In August 2009 businessman Vijay Mallya’s Force India created history by becoming the first Indian team to race in Formula One. As the nation basked in the glory, Mallya proposed building an F1 track near Delhi and asked for tax exemption for the project. The sport minister was M.S. Gill and his response was: “F1 is not sports. The proposed F1 race does not satisfy conditions which focus on human endeavour for excelling in competition with others.” Translation: Get lost. The F1 track was built anyway, without tax breaks. Comparisons are inevitably made to the other Asian giant China, which topped the gold medals tally in the last Olympics. China’s success in sports is attained through a massive programme that scouts the country’s schools for promising young players, who are then groomed at numerous world class academies. It is the academies – not the athletes – that decide who will play what. Sport is not for fun, it is a serious matter in the communist nation. The whole exercise is aimed at winning gold medals in the Olympics to boost national pride. China understands the importance of sports as a propaganda tool. It is doing exactly what the US is doing. India is different. Historically, we are a diehard sporting nation. All the ancient Hindu epics mention archery, mace, wrestling, chariot racing, fencing, and equestrian competitions. Sports festivals are common in every district across our vast country. This tremendous energy and passion, however, remains untapped. Indian school children regularly win gold medals at world school competitions but within a few years the gap widens as the foreign kids peel away because of their superiors systems. The US and UK pump billions of dollars into prestige oriented programmes that aim to send their boys and girls on to the podium. The UK, for instance, pumps in money from its state lottery into cycling. Russia’s Vladimir Putin has asked leading corporations to sponsor an individual sport or a team. India, on the other hand, remains wedded to Nehru’s philosophy of “participation is more important than winning”. If we aim low, we hit the ground instead of the target. In hockey we were a powerhouse (eight golds) and in football we made it to the quarterfinals of the Melbourne Olympics. The philosophy of participation has led to the current situation where we can’t even participate. In contrast, take Slovenia. The tiny Balkan nation, which became independent in 1991, has a population of just two million and only 40,000 registered sportspersons. But they make up for these small numbers by their strong sporting culture – the country has 3500 sporting associations and fully one-third of Slovenian adults play some sport at least once a week. In Athens 2004 the Indian contingent brought home a grand total of one silver. In Beijing 2008, the tally was one gold and two bronze medals. Overall, India has won all of 18 medals since 1928, with hockey contributing 11 to that tally. 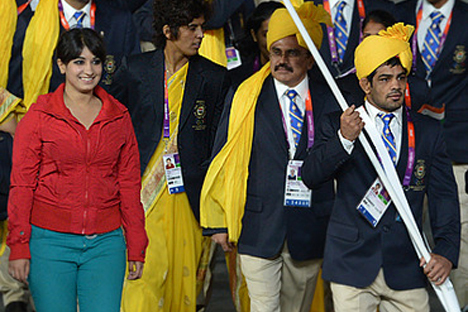 At London 2012 India has a contingent of 141. Only 81 of these are athletes. You get the picture. There might be a couple of flashes of individual brilliance but other than that nobody’s expecting a medals surge.